Lighthouse is a charity specialising in connecting new developments in art, technology and society. Our central Brighton venue can be hired for meetings, workshops or screenings. When you hire one of our spaces you are supporting our artistic programme and talent development schemes. 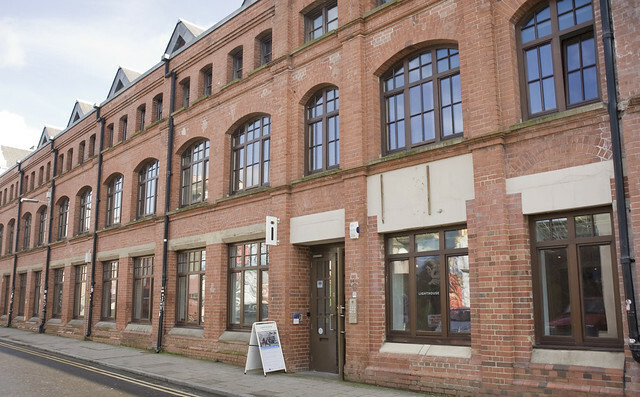 We have a choice of three flexible rooms all located in the former printworks we share with a number of creative and cultural business tenants. Lighthouse is in the heart of the North Laine, Brighton’s vibrant cultural quarter – surrounded by great bars and restaurants, and just a ten-minute walk from the train station and the sea front. Our events team provide first-rate support, as well as professional audiovisual equipment and quality catering on request. Download our venue hire brochure here. The Conference Room is our most popular space for meetings, workshops, brainstorming and away-days. The room is bright and airy, is equipped with a projector, and is fully air-conditioned. Capacity: 14 classroom (u-shape facing projection wall) / 16 boardroom (closed ended, not facing projection wall) / 25 theatre style. Size: 45 sq metres. Projector: Hitachi CP-X505 LCD Projector. The projector is setup with a VGA lead and we can provide the following adaptors: VGA to HDMI, VGA to Apple mini display port, VGA to USB-C. Speakers: stereo, which you can connect through a phono lead. The Digital Lounge is a large multi-purpose space, suitable for seminars, screening and workshops. Its flexible layout and size makes it ideal for interactive and hands-on workshops, and also provides a good backdrop for photo shoots. It is equipped with a projector and is fully air-conditioned. Capacity: 24 classroom (u-shape facing projection wall) / 70 theatre / 30 cabaret style. Size: 76 sq metres. Projector: Optoma DH1010 (2011), resolution is 1080p full HD – 16:9 presentation ratio. The projector is setup with a VGA lead and we can provide the following adaptors: VGA to HDMI, VGA to Apple mini display port, VGA to USB-C. Speakers: The room has a surround sound speaker set-up in there which you can connect to through a phono lead. Prjector: Acer P7500, resolution is 1080p full HD – 16:9 presentation ratio. The projector is setup with a VGA lead and we can provide the following adaptors: VGA to HDMI, VGA to Apple mini display port, VGA to USB-C.
We work with a range of catering partners, and can provide catering for breakfast meetings, business lunches and post-conference drinks and receptions. Refreshments – Tea, coffee, biscuits: £2+VAT per person. Top-ups £1+VAT per person. We have a fully licensed mobile bar that can be hired with service staff. Individual quotes can be provided on request – please contact us for details. All meeting rooms come equipped with wifi, air conditioning, a flipchart and pens. The Conference Room and Digital Lounge have ceiling mounted projectors installed, as well as surround sound. A Technician can be booked if required. Evening & Weekends: Our standard opening hours are 0900-1730 Monday to Friday. Our venue is available to hire outside of these hours, subject to availability, get in touch for more details. Less than 48 hours notice: 80% of room hire and equipment costs. Less than 5 days notice: 30% of room hire and equipment costs. If you would like to speak to our events team about your booking or arrange a venue visit, please call Ben or Emma on 01273 647197 or email info@lighthouse.org.uk. Room hires are not confirmed until a completed room booking form is received. Our venue is fully accessible for wheelchair users. We do not have access to any parking spaces at Lighthouse. The nearest disabled parking bay is in Robert Street. The nearest car park to Lighthouse is situated on North Road. Though beware, the tariff can be very expensive after 9am. More info is here. The most reasonably priced carpark is off Trafalgar Street, just two streets away from Lighthouse. More info is here.